In high school, right after I had composed my first two or three pieces of music, I started to take what were called at the time “jazz piano lessons”, but they really turned out to be a combination of piano, jazz, theory, and composition. From those lessons, and from that amazing teacher, I learned so many things over the next three years. Among the countless useful techniques, tips, and tricks he showed to me, my teacher introduced me to a concept that I had barely begun to scratch the surface of at the time, and the topic of interest today: chords that go beyond simply major and minor. Now while there are many, many characteristics of jazz music, the main takeaway that I got from those lessons was the importance of complex chords. I did go through a brief compositional phase where I thought that with this knowledge, I had to use only these complex chords, which overwhelmed me immensely, but luckily that notion lasted for only a few months, after I finally realized that major and minor chords at their most basic level will always have their solid, rightful place. The Kingdom Hearts track of interest today would not necessarily be considered a “jazzy” track as a whole, but the opening of the piece—just the first six notes, in just the first three seconds—can certainly be classified and spelled as a “jazz” chord, which is what we are going to be going through today. Let’s listen to “Destiny’s Force”, which was first heard in Kingdom Hearts I, in the battle on Destiny Islands against the Darkside, and is now used as one of the Raid Boss battle themes in Kingdom Hearts Union Cross. The rest of the track, after the first three seconds, is full of suspenseful strings, pounding percussion, valiant trumpet riffs, and epic modulations. Given the context of the track’s first appearance in the game, it is only natural that it would be as intense of a track as it is. But, like I said, we are only going to be focusing on the first three seconds of the piece. Let’s take these six notes apart, shall we? Here is what they look like played separately (as they are in the piece). Now the key thing to remember about spelling/naming chords is that they are most easily analyzed when stacked in thirds. Now let’s unpack this chord. Fortunately for us, the chord is already in root position, meaning the bottom-most note is the root of the chord, and (almost) all of the other notes are already stacked in thirds, as I previously mentioned. When figuring out the quality of a chord, you always start from the bottom, and work your way up. The bass note (the lowest note) is G, so the name of the chord will be G-something. The second note from the bottom is a minor third up, Bb (in the major scale of G, B is usually natural, so Bb—which is one semitone lower—is a minor third), so we know it will be a G minor-something. The third note from the bottom is a C, and we’ll get to its function after we’ve finished labeling the others. The fourth note from the bottom is D, which is a fifth up from G, so D‘s function is just to reinforce G. With this information we still know that the chord will be a G minor-something. The fifth note from the bottom, and final note, is an F. In the G major scale, F is usually sharp, so an F♮ plays the role of a minor seventh. So, with the other four notes below (minus the C), we can conclude that the chord is a G minor seventh-something. But, since there is no A in the original chord, it would not make sense to put the C way up above F. Since C does not fit into the stack of thirds, we will keep the name G minor seventh, and simply capture the C with the addition of “add 4” (C is a fourth above G). 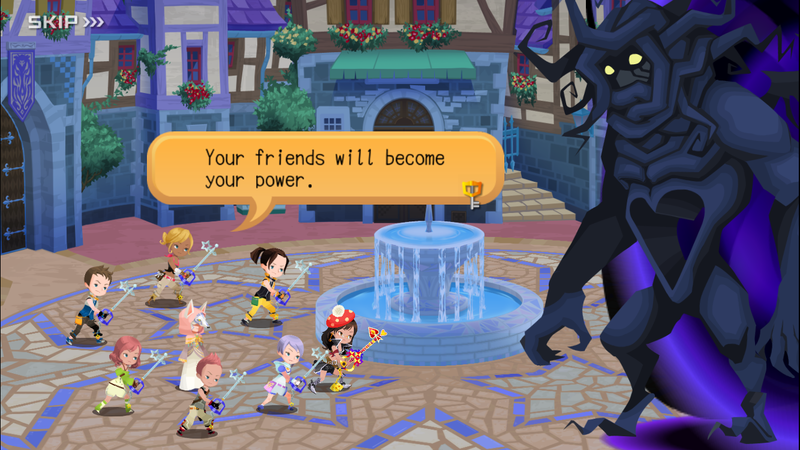 Stay tuned for more Single-Track Analysis Articles of tracks from Kingdom Hearts Unchained X / Kingdom Hearts Union Cross! One article every day in the month of April 2017!